You can scan an image to a memory device or to your computer using your product's control panel. Note: To scan a double-sided document, place it in the ADF. Memory Device saves your scan file on a memory card or USB device and lets you select the file format, quality, and other settings. Computer saves your scan to your computer or as an image capture in OS X 10.6/10.7/10.8/10.9. Computer (WSD) lets you manage network scanning in Windows 8, Windows 7, or Windows Vista (English only). To use this feature, you must first set up WSD (Web Services for Devices) on the computer. Select Presets or press the Preset button (WF-3620) to save your scan settings. If you are scanning to a computer, select the target computer, then select the format and 2-sided setting if necessary. 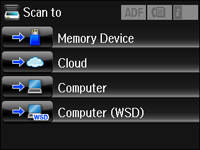 If you are scanning to a memory device, select Settings to display additional scanning options.